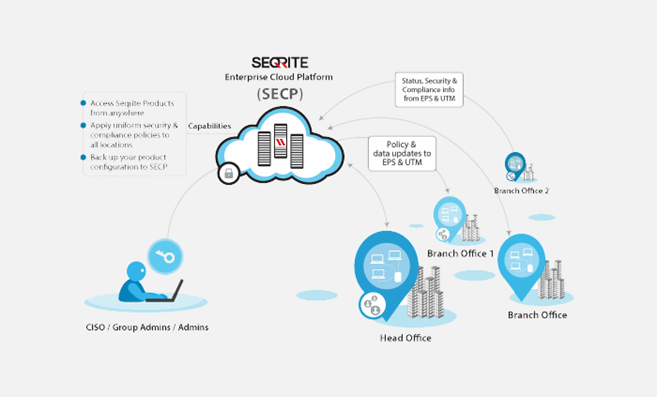 Seqrite Cloud is an integrated solution that allows the management and regulation of multiple Endpoint Security and TERMINATOR products deployed at different geographical locations. IT administrators from any location can easily connect to the cloud to view the latest security status, configure product policies, receive notifications and rectify critical network events from one single dashboard. It also facilitates policy configuration, backup and more on the cloud for Seqrite products. Seqrite Cloud, with its simplified management console, helps to manage the overall health of the distributed enterprise network protected by Seqrite Endpoint Security and Seqrite TERMINATOR. Seqrite Cloud lets you easily register and integrate your various Seqrite Endpoint and Seqrite TERMINATOR servers that are distributed across several geographic locations.